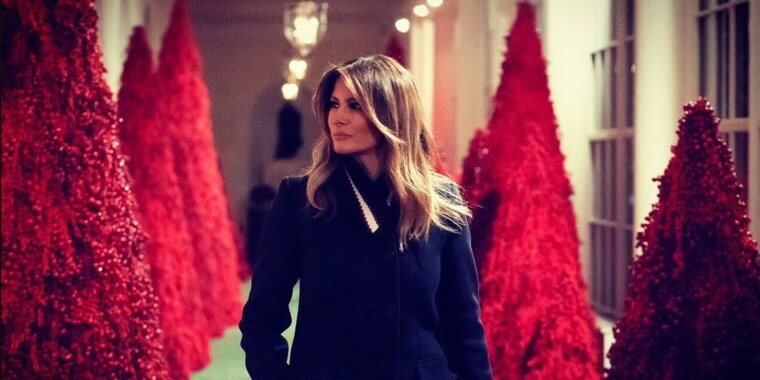 The first lady responded to criticism and jokes about the red trees that are part of this year's White House Christmas decorations. Melania Trump defended this year's White House Christmas decorations after photos of a hallway filled with all-red Christmas trees sparked criticism and jokes. Speaking Wednesday during a town hall event at Liberty University in Lynchburg, Virginia, the first lady, who unveiled the holiday decor Monday, remarked on the response to the 40 crimson topiary trees lining the East colonnade of the White House. "We are in (the) 21st Century and everybody has a different taste,'' she said. "I think they look fantastic. I hope everybody will come over and visit it. In real life, they look even more beautiful." The trees are part of this year's White House theme, “American Treasures,” which celebrates patriotism and honors elements of the country’s heritage. The color red can be found in other places throughout the decor; 29 additional Christmas trees located in the cross area between the Grand Foyer and Cross Hall in the White House are dressed with more than 14,000 red ornaments. "The choice of red is an extension of the pales, or stripes, found in the presidential seal designed by our Founding Fathers," the White House said in a statement Monday. "It’s a symbol of valor and bravery." The unorthodox red trees were likened online to everything from the sea of blood in "The Shining" to the red cloaks worn by women in the dystopian saga "The Handmaid's Tale." Other White House decorations include the East Wing's Gold Star Family tree honoring military members and their families. Visitors can write messages to loved ones in the military on digital tablets provided. The official 18-foot White House Christmas tree in the Blue Room is decked out in more than 500 feet of blue velvet ribbon embroidered with each U.S. state and territory.